About 4 miles north of Byland Abbey, there are the ruins of Rievaulx Abbey. The moment I saw the ruins, my eyes were caught by the thick columns and beautiful arches. As the outer walls had fallen down completly, I coud see the columns and arches of arcades of the inside. I was able to appreciate the three storied structure of the church very well, which was consisted of arcades, triforiums and clerestories. The arches of arcades, triforiums and clerestories become smaller as they go upwards, rhythmically and elegantly. The beautiful lines of fluted columns and arches reminded me of the gathers of robes which the Goddesses of Greek myths wear. While the ruins of Fountains Abbey have sturdy and dignified beauty of the masculine form, I can say, those of Rievaulx Abbey have the refined and graceful beauty of the feminine form. In the north (actually almost east) outside of the presbytery, I coud see the traces of flying buttresses too. 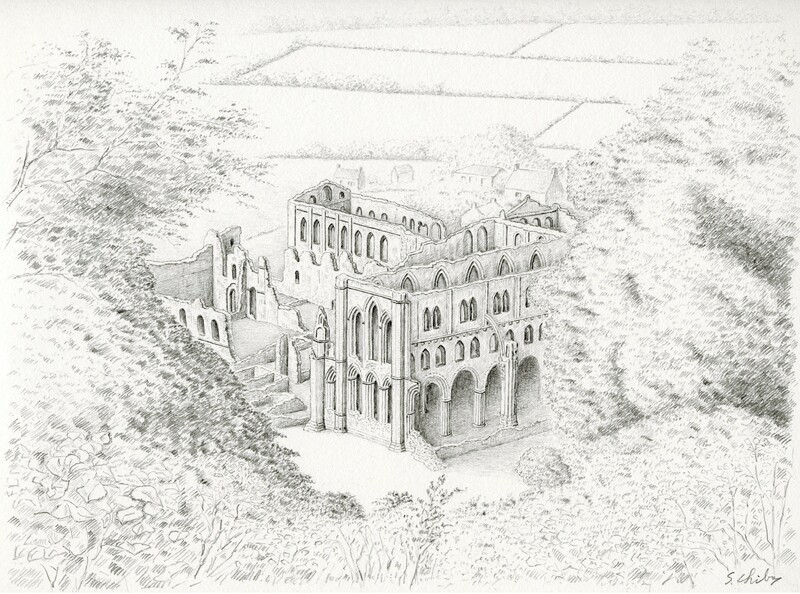 Rievaulx Abbey was founded in 1131, the second oldest Cistercian abbey in England, and completed in the 13th century. (The oldest one is Waverley Abbey founded ihn 1128 in Surrey.) It was 1539 when this abbey was dissolved to become ruins. Most parts of the church were built in the Norman style. 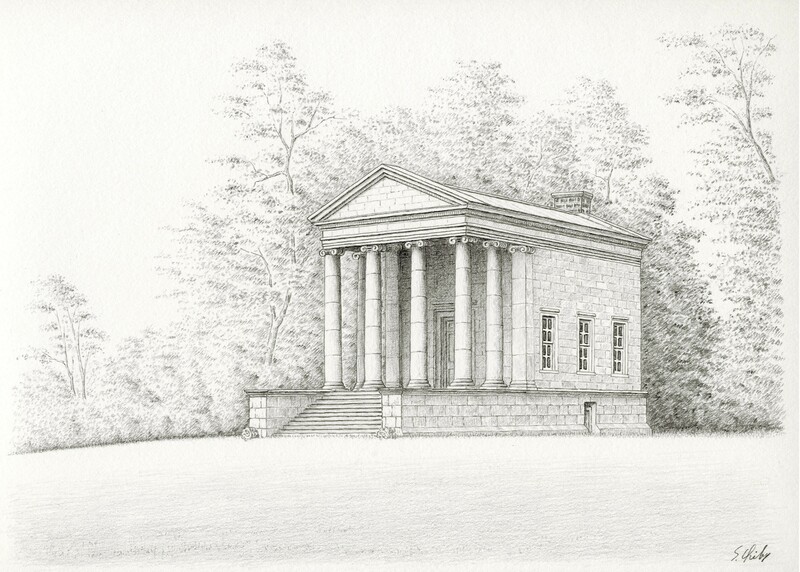 The presbytery which was the last parts to be built is in the Early English style. The record says there were 140 monks and 500 lay brothers at Rievaulx during the days of the most famous abbot, St Ailred, in 1165. 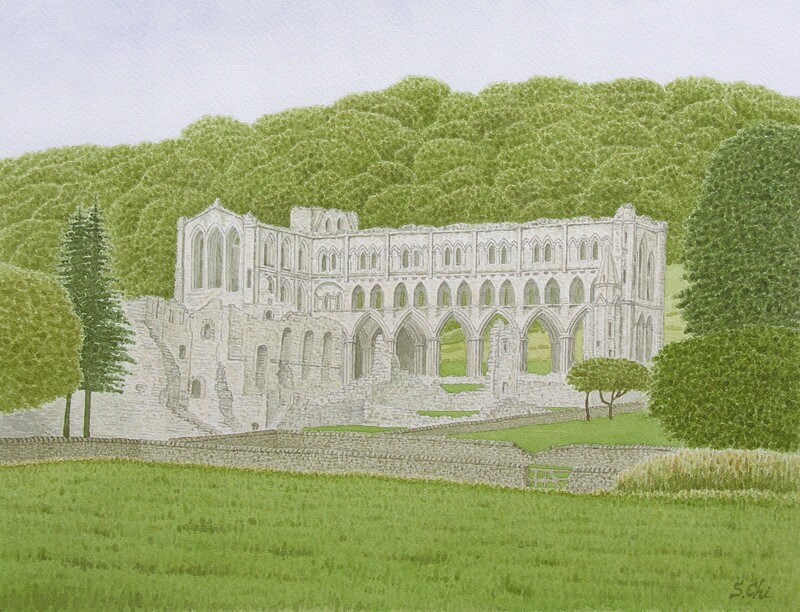 Fountaoins Abbey was larger thab Rievaulx, so there would be more monks and lay brothers there. When I visited here in late October, I climbed Rievaulx Terrace, the landscaped garden spread on the hill on the east of the ruins. The view of the ruins from the Terrace through the boughs and branches of trees was fantastic. At twilight I could imagine the Vespers sounding from the ruins.